I really enjoyed a wonderful sunny day beside The Royal Military Canal at Appledore. I joined Joanne Weaver's art group for another painting out on location day. It was great fun - but very hot! Thank you Jo for the invite and for providing us with the much-needed ice cold bottles of water in the afternoon! 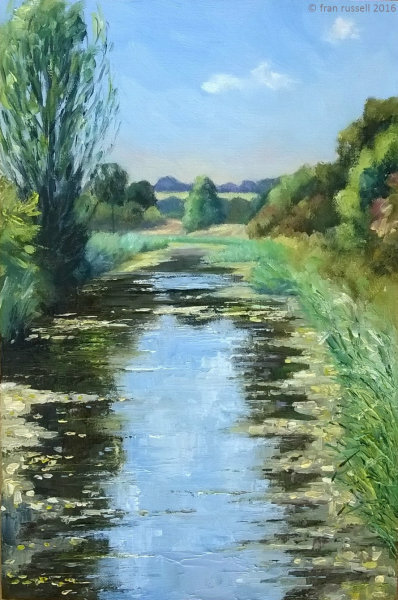 This painting was shortlisted for the "Kent Life Landscape Painter of the Year" competition and was exhibited along with all the other finalists work at Lovelys Gallery, Cliftonville, Margate for 2 weeks in March 2017.